For other uses, see Belshazzar's Feast (disambiguation). "The writing on the wall" redirects here. For other uses, see The writing on the wall (disambiguation). Belshazzar's feast, or the story of the writing on the wall (chapter 5 in the Book of Daniel) tells how Belshazzar holds a great feast and drinks from the vessels that had been looted in the destruction of the First Temple. A hand appears and writes on the wall. The terrified Belshazzar calls for his wise men, but they are unable to read the writing. The queen advises him to send for Daniel, renowned for his wisdom. Daniel reminds Belshazzar that his father Nebuchadnezzar, when he became arrogant, was thrown down until he learned that God has sovereignty over the kingdom of men. Belshazzar had likewise blasphemed God, and so God sent this hand. Daniel then reads the message and interprets it: God has numbered Belshazzar's days, he has been weighed and found wanting, and his kingdom will be given to the Medes and the Persians. That very night Belshazzar the Chaldean (Babylonian) king was killed, and Darius the Mede received the kingdom. Belshazzar, in contrast, learns nothing from Nebuchadnezzar's example, blasphemes against God, and his kingdom is given to others. 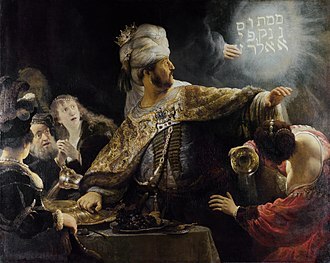 Belshazzar's feast is a legend conforming to the subgenre of the "tale of court contest," complicated by the inclusion of Daniel's indictment of Belshazzar's pride and his failure to honour the God of Israel; as a result the tale has a double ending, in which Daniel is first showered with rewards and honours for interpreting the omen, and the king is then punished to fulfill the sentence pronounced by Daniel. Rembrandt, Belshazzar's Feast, 1635, (National Gallery, London). The message is written in vertical lines starting at the top right corner, with "upharsin" taking two lines. This summarizes the narrative, as found in C. L. Seow's translation of the text in his commentary on Daniel. Daniel reads the words "MENE, MENE, TEKEL, UPHARSIN" and interprets them for the king: "MENE, God has numbered the days of your kingdom and brought it to an end; TEKEL, you have been weighed ... and found wanting;" and "PERES, your kingdom is divided and given to the Medes and Persians. Then Belshazzar gave the command, and Daniel was clothed in purple, a chain of gold was put around his neck, and a proclamation was made… that he should rank third in the kingdom; [and] that very night Belshazzar the Chaldean (Babylonian) king was killed, and Darius the Mede received the kingdom." woodcut by Julius Schnorr von Karolsfeld, 1860. The Chaldean wise men are unable to read the writing on the wall, let alone interpret it, but Daniel does so by supplying vowels in two different ways, first so the words are read as nouns, then as verbs. The nouns are monetary weights: a mənê, equivalent to a Jewish mina or sixty shekels (several ancient versions have only one mənê instead of two), a təqêl, equivalent to a shekel, and p̄arsîn, meaning "half-pieces". The last involves a word-play on the name of the Persians (pārās in Hebrew), suggesting not only that they are to inherit Belshazzar's kingdom, but that they are two peoples, Medes and Persians. Daniel then interprets the words as verbs, based on their roots: mənê is interpreted as meaning "numbered", təqêl, from a root meaning to weigh, as meaning "weighed" (and found wanting), and pərês (פְּרַס), the singular form of p̄arsîn, from a root meaning "to divide", denoting that the kingdom is to be "divided" and given to the Medes and Persians. If the "half-pieces" means two half-shekels, then the various weights—a mənê or sixty shekels, another shekel, and two half-shekels—add up to 62, which the tale gives as the age of Darius the Mede, indicating that God's will is being worked out. It is generally accepted that the Book of Daniel originated as a collection of folktales among the Jewish community in Babylon in the Persian and early Hellenistic periods (5th to 3rd centuries BC), and was later expanded in the Maccabean era (mid-2nd century) with the visions of chapters 7–12. 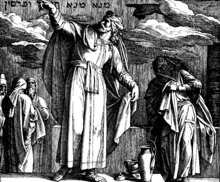 Modern scholarship agrees that Daniel is a legendary figure, and it is possible that his name was chosen for the hero of the book because of his reputation as a wise seer in Hebrew tradition. Daniel 5 is thus composed as a companion-piece to Daniel 4, the tale of the madness of Nebuchadnezzar, the two giving variations on a single theme. This is spelled out in chapter 5 when Daniel draws a direct parallel between the two kings: the fate of Belshazzar illustrates what happens when a king does not repent. The story is set around the fall of Babylon, when on 12 October 539 BCE the Persian conqueror Cyrus the Great entered the city. Its last king, Nabonidus, was captured, and his fate is unknown, although he may have been exiled. Several details in the text do not match the known historical facts. Belshazzar is portrayed as king of Babylon and son of Nebuchadnezzar, but was actually the son of King Nabonidus, one of Nebuchadnezzar's successors, and never became king. The conqueror is named as Darius the Mede, but no such individual is known to history; and the invaders were not Medes, but Persians. This is typical of the story's genre, in which historical accuracy is not an essential element. Chapters 2 and 7 tell how all worldly kingdoms will come to an end and be replaced by the kingdom of God, and chapters 3 and 6 tell how pious Jews withstand the arrogance of earthly kings and are rescued by the God of Israel. Chapters 4 and 5 form the center and carry the most important message in their parallel but contrasting tales of Nebuchadnezzar and Belshazzar. The first is humbled by God, learns his lesson (he acknowledges the ultimate kingship of the Jewish God), and is restored to his throne; Belshazzar, in contrast, learns nothing from Nebuchadnezzar's example, blasphemes against God, and has his kingdom given to others. ^ a b Seow 2003, pp. 74–75. ^ a b Albertz 2001, p. 178. ^ Seow 2003, p. 75. ^ Seow 2003, p. 80. ^ a b Seow 2003, pp. 82–83. ^ Seow 2003, p. 83. ^ Seow 2003, p. 84. ^ Collins 1984, pp. 29, 34–35. ^ Collins 1984, p. 28. ^ Redditt 2008, pp. 176–77, 180. ^ Redditt 2008, p. 177. ^ Collins 1984, pp. 67, 70. ^ Newsom & Breed 2014, p. 165. ^ Waters 2014, pp. 44–45. ^ Collins 2001, p. 2. ^ Seow 2003, p. 7. Albertz, Rainer (2001). "Social Setting of Daniel". In Collins, John J.; Flint, Peter W.; VanEpps, Cameron (eds.). The Book of Daniel: Composition and Reception. I. Brill. ISBN 9004116753. Collins, John J. (2001). "Current Issues in the Study of Daniel". In Collins, John J.; Flint, Peter W.; VanEpps, Cameron (eds.). The Book of Daniel: Composition and Reception. I. Brill. ISBN 0391041274. Redditt, Paul L. (2008). Introduction to the Prophets. Eerdmans. ISBN 9780802828965. Waters, Matt (2014). Ancient Persia: A Concise History of the Achaemenid Empire, 550–330 BC. Cambridge University Press. ISBN 9781107652729. This page was last edited on 7 April 2019, at 00:41 (UTC).